Last year, I discovered my love for knitting, and I finally learned the basics over Christmas. The neighbor (Mom’s neighbor who will always be my ‘neighbor’ regardless of location) spent some time teaching me what I needed to know to get started. And since that time, I’ve learned a lot through books, friends who knit and trial and error. I have several hobbies, but right now knitting is my favorite so I’ve decided to share my latest little creation. Since falling in love with my new hobby, I’ve knitted several scarves, hats, trivets and yoga mat bags and other fun things. I even made custom bamboo knitting needles – bamboo is my favorite! Yesterday I decided that I’d like to make a snowman so I thought it through, and this was the end result. What are your favorite hobbies? How do you enjoy your free time? Oh, yeah. A carrot would be cute! I just started knitting recently, too. When I'm not yelling at my yarn, I find it to be quite stress relieving. That snowman looks fantastic! Great job. Your snowman is super cute! I've tried knitting several times and I just can't get the nack for it. He is super cute! My daughter and I are trying to teach ourselves crochet, because we have 4 friends with babies due in September and we want to make them blankets. I think will be a more productive hobby than my others (reading, eating and cooking)! girl – you are SOOO crafty – this is the cutest thing EVER!!!! WOW – you thought it up then did it? That's awesome. 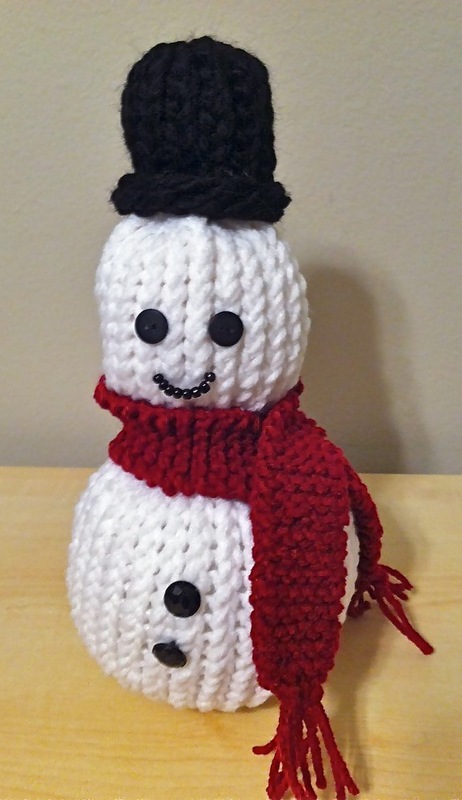 I just started crocheting…but am no where near ready to branch out on my own. I need a pattern and maybe even a video. 🙂 Great Job! My sister tried to teach me to crochet but I found I didn't have the patience. I was sitting in chemo and worked 5 hours crocheting – I ended up with a long red worm! Not the lovely scarf that I was hoping for. Honestly I gave up and went back to painting! Thought you might get a kick out of a really amazing artist. My friend Nathan Vincent is a sculptor who focuses on making representations of typically masculine objects in a typically feminine medium: he knits them. His work is fun, intricate, and he even got booked on The Martha Stewart Show to share his pieces on TV! Can't wait to see your next creation. Keep it up! He's super cute! How about getting a golf tee (they do have orange ones) and sticking it through the backside before you sew him up? It'll look like a carrot! That is SOOOOO cute!!!! FUN!! If he has no nose, how does he smell? The answer, he smells like yarn! That's SOOOOO bad!!! Cute snowman, I like to play with my daughters, shop and read.